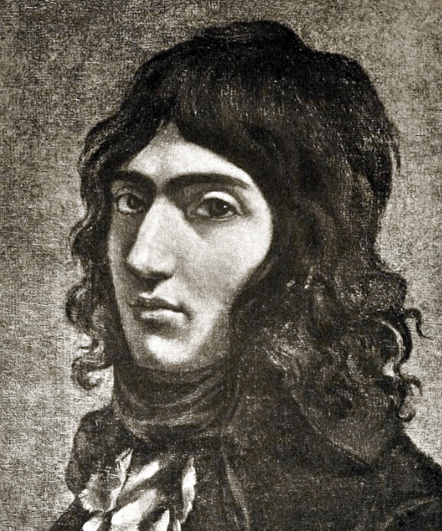 Camille Desmoulins (1760-1794) was a politician and writer, probably the best known journalist of the French Revolution. Desmoulins was born in a small town in Picardy, northern France; his father was a government magistrate. 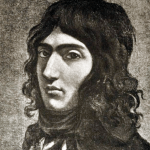 As a teenager, Desmoulins gained a scholarship to attend boarding school in Paris. There he met Maximilien Robespierre from Arras; the two became friends, fellow law students and, later, political collaborators. Desmoulins graduated as a lawyer in the early 1780s and obtained a position working with the Paris parlement – however his nervousness and verbal stutter thwarted his prospects as a barrister, so he turned to writing. His first notable work, a radical republican pamphlet titled La France Libre, appeared on the streets of Paris in mid-1789. It was widely read, praised by revolutionaries and condemned by royalists and moderates. Desmoulins came to prominence the day after the dismissal of Jacques Necker, when he addressed a large crowd at the Palais Royal. Louis XVI was a reactionary despot who hated and feared the people, Desmoulins told the crowd, and an attack on Paris by royal troops was imminent. This speech contributed to the hysteria and insurrection in Paris between July 12th-14th. In October 1789 Desmoulins co-founded the Cordeliers Club along with Georges Danton, who became his friend and political ally. He played a leading role in the republican petitions of mid-1791. In September 1792 Desmoulins was elected to the National Convention, where he voted for the execution of the king and participated in the overthrow of the Girondins in mid-1793. Though aligned with Robespierre until the summer of 1793 he grew concerned about the growing radicalism, both in the Convention and on the streets of Paris. By late 1793 Desmoulins was siding with Danton and his moderate followers and attacking the excesses of the Terror in his newspaper, Le Vieux Cordelier. He was accused, tried and executed with Danton in April 1794.